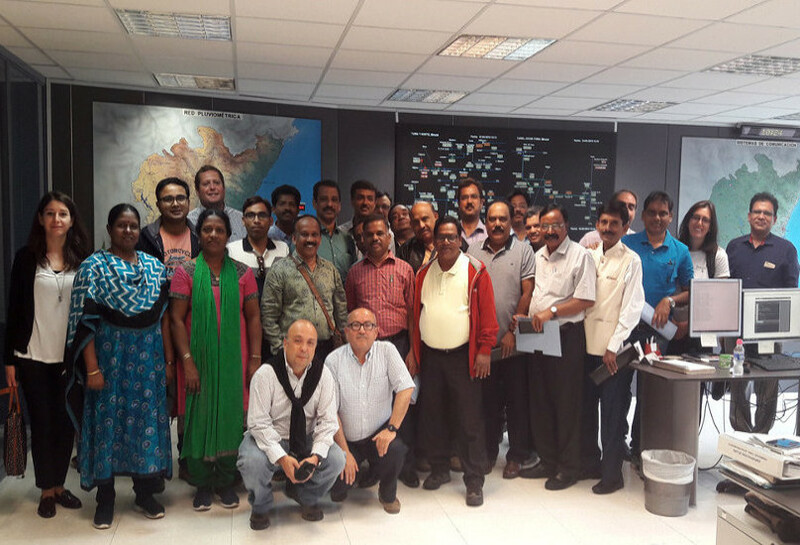 From May 21 to 23, iPresas organized a dam safety training course to a delegation of the Government of India, including 25 experts. The course is part of the cooperation and training agreement that India has signed – in the framework of the DRIP project – with the Deltares Research Institute, who has delegated to iPresas and the UPV the part related to dam safety management, “including the application of risk analysis techniques as a tool to support decision-making on dam safety, “says Jessica Castillo, project manager ofiPresas. The training consisted of a 1–day of theoretical and practical lectures that addressed the description of the current context in dam safety in Spain, as well as an introduction to risk analysis techniques applied to dam safety management. In addition, a practical case was conducted to analyze hydrological risk for a gravity dam based on a real case study. During the following two days, the group visited the Cortes-La Muela and Tous dams, as well asthe headquarters of the Júcar River Basin Authority in Valencia (CHJ). Specifically, the visit aimed to improve the knowledge of these professionals in hydrological and water resources planning, with special focus on flood and drought management. In fact, the delegation visited the offices of the Automatic Hydrological Information System (SAIH). “During the visit, they assisted a lecture about the general framework of river basin management in Spain, along with organizational and monitoring aspects of the Jucar River Basin and their experience on water resources management”, explains Jessica Castillo. This is the second time that a delegation from the Government of India (belonging to different States, such as Kerala, Odisha or Uttarakhand) visits Spain as part of the program funded by the DRIP project. The DRIP project (Dam Rehabilitation and Improvement Project) coordinated by the Central Water Commission of India and with the financial assistance of the World Bank, to rehabilitate 225 dams in the Asian country. Within the framework of this project, iPresas, in collaboration with the international consultancy EGIS EAU (France), has worked in 2018 in the development of a guide for the analysis and management of the risk of dams in India, which helps to improve the safety of these infrastructures.